For statist reasons of control, there is more pressure on all schools to demonstrate "student outcomes" based on measurable and universal standards. Schools are not left to their history, choice of faculty, or institutional values; they must conform to alien criteria demanded from above. This sad state erodes the essence of teaching and learning, which is (amazingly enough) the teacher-student relationship. The assessors become mediators, interlopers who neither teach classes nor know students. The teachers are not trusted to teach and grade according to their competence. Grades, which used to be the basic standard of assessment, are not enough. We must assess learning in other ways, too. So, we must ask, why not assess the assessors, and so on...forever? Those who cherish the Western patrimony of knowledge needing students and students needing knowledge through teaching and learning will have a hard fight ahead. But I, for one, will not give up. I am reading a bit in John Wilkinson's book, No Argument for God. So far, in just a few pages, he has committed several egregious logical and theological errors. He will serve as a negative example for my upcoming talk for The Gordon Lewis Center for Christian Thought and Culture, September 23, 7:00 PM, Room #119. Come early; it may be full. The first event for the Gordon Lewis Center for Thought and Culture is Monday, September 23, at 7:00 PM in room #119. My lecture is "Is Faith Above Reason?" On Tuesday, September 24, Mark Mittelberg speaks on "Understanding Secular Culture." Please pray for these events and mention them to your classes and others. Dr. Lewis is joining us and making brief comments after each lecture. Our goal is to make Denver Seminary Denver's Seminary by creatively reaching into Denver culture with the knowledge of God to further his mission. 2. Do not trail off at the end of sentences. 3. Learn to pronounce words correctly. My wife helps me with this! 4. Salt your speech with the Bible and great quotations. 5. Do not interrupt the other person. 6. Do not speak loudly if not necessary. 8. Develop and apt and ready vocabulary. 9. Try to avoid hackneyed expressions and worn out metaphors. See George Orwell, "Politics and the English Language." 10. Avoid stutter phrases and overused expressions. This is boring at best and annoying at worst. You lose credibility as a thoughtful speaker. 11. Read The Book of Proverbs, attending to what it says about the speech of a fool and that of a wise man. 12. Do not have gum in your mouth while speaking to someone else, even if you are not chewing. This is rude and can even make the other person nauseous. I know. 13. Do not speak so rapidly or slowly that this detracts from your demeanor and ability to communicate well. 14. Do not interrupt yourself. Even some well-known speakers do this constantly--Rush Limbaugh and Denis Prager, for example. This requires forethought and patience. 15. Protect your voice by hydrating enough and not speaking much when you have a sore throat. Yelling can also damage your voice. 16. Do not speak on a cell phone such that you interrupt or detract from unmediated discussions. 17. Do not repeat yourself if not necessary. Life is too short for that. 18. If you are funny, do not hide behind your humor. 19. If you seem to be more intelligent than the person to whom you are speaking, do not play on that. 20. If you seem less intelligent than the person to whom you are speaking, try to learn from the other person instead of being intimidated. 21. Try to speak as you would write (if you write well). See John McWhorter, Doing our Own Thing. He is a linguist. C.S. Lewis's demon, Screwtape, to the junior demon, Wormwood, from The Screwtape Letters. Here is the audio for my sermon, "The Authority of the Bible for Life and Thought: Divine Inspiration." 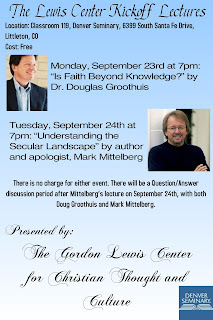 Doug Groothuis and Mark Mittelberg Lectures: "Is Faith Beyond Knowledge?" and "Understanding the Secular Landscape"
The inaugural event for the Gordon Lewis Center for Christian Thought and Culture is coming up in September, and will be held at Denver Seminary. This is a two-night pair of lectures. 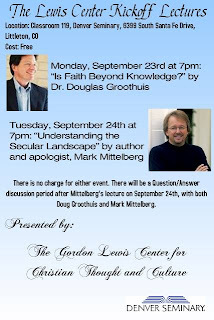 The first is on Monday, September 23rd, at 7pm, and will feature Dr. Groothuis speaking on the relationship between faith and reason. His talk is called, "Is Faith Beyond Knowledge?" The next night (September 24th), at 7pm, Mark Mittelberg will speak on the relationship between apologetics, evangelism, and culture. Mark's talk is called "Understanding the Secular Landscape." 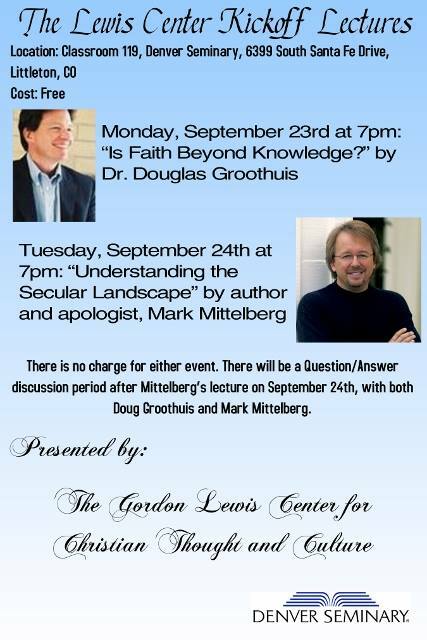 After the second night, there will be a time for question/answer with both Dr. Douglas Groothuis and Mark Mittelberg. Both talks will be in classroom 119. Furthermore, both events are free for everyone, and we welcome students and non-students, Christians and non-Christians. The Lewis Center seeks to be a resource to the entire Denver community, so we would greatly appreciate it if you could help us spread the word about this event and ministry.